Growing up living next to a cornfield, there were always certain things that worried me. What if the scarecrows came to life and attacked my house in the middle of the night? Or what if I was running through the cornfield chasing after a baseball and one of the cornstalk leaves accidentally slit my throat? Better still – what if a group of kids in town decided to murder all of the adults to ensure a successful corn harvest and sacrifice someone in the cornfield to appease a God called ‘He Who Walks Behind The Rows‘? That last one sounds like something from a movie. Oh – it is from a movie! Duh. – The coffee in Gatlin, Nebraska is pretty terrible. – Milkshake whipped cream mustaches are funny even during mass murders. – If you need to test the effectiveness of your meat slicer, put someone’s hand in it. Now unfortunately, the rest of the movie didn’t live up to the hype of the opening scene. Sure, we get a pretty good bad guy in Isaac and get a classic line from his right hand man Malachai (“Outlander!!!!! We have your woman!”) – but overall everything was downhill after the intro for the most part. But what an intro it was, and it’s quite the high honor that it kind of still gives me the creeps. 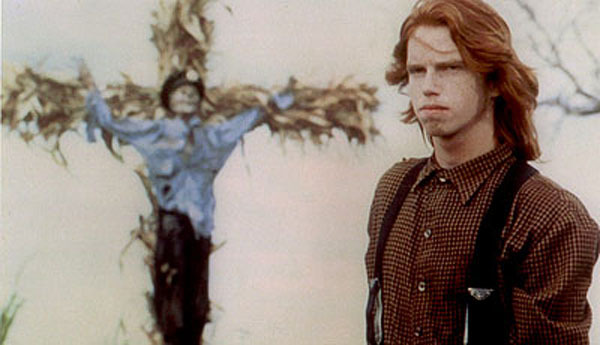 So to recap, Children Of The Corn opening scene = good. The rest of Children Of The Corn = not so good. Now let’s see a pic of Malachai’s luscious red hair to round this sucker out.